TravelPerk is a free travel management tool for booking, tracking, and reporting your business travel, all in one place. What Travel Management solution do you use? "Quick to on board and seemless booking. How refreshing! " Interface, layout, speed, and clarity of information. Confirmation workflow is slick and clear. Less is more. These guys have nailed that! The team likewise have taken t it quickly without any pain points. The App is great too! Managing a team's bookings has room to improve, ie the workflow of the email click through and the fact that your trips are mixed with your teams trips. Could be made clearer. Have fed back and they've responded positively about my suggestions. Keep the chain of command as flat as possible for authorisation. Being in control of your own bookings makes a lot of sense as there are so many parameters involved to ensure an efficient trip that meets personal requirements. PAs always struggle to get all the elements right to no fault of their own. If you do it yourself though it has to be QUICK and easy! This is the closest we've ever come to that perfect mix. "Great way to organise trips"
Customer support is just great - whatever issue you may face, the support is great and effective. All the trips are in order, you can check past trips, upcoming trips, trips which you have saved for later booking. You don't need to enter passport details every time you book the trip, so it saves time. You are receiving the invoice immediately, all the invoices are in order in your account - very useful. The only thing which I dislike is that you can book the trip for max 8 people. So if the group is bigger, you have to split people into two groups. While you book the trip for first group, the flights price increase for the second group. The biggest benefits: al the trips are in order, well organised, and TravelPerk is very convenient to use and saves time. Whenever you need help, you are receiving it immediately. "Review of travel booking tool, Travelperk"
Travelperk is so straightforward to use and offers a wide choice of flight options and accommodation. Really liked how you can add airline loyalty scheme details to my profile, so points are collected automatically upon booking a flight through the tool. I have no recommendations for change at this time. The tool, as is, serves my needs really well. you should consider whether your current system offers the same ease of use, control measures, and volume of options as Travelperk does. If you are not satisfied with your current provider or booking tool, I recommend you give Travelperk a try. Previously was using a 3rd party to book my work travel - meaning I was providing that service provider with the same info that I would put into Travelperk, anyway. So, by using Travelperk, I can save a lot of time making my booking and am no longer relying on a 3rd party responding to me with confirmation of my booking, which is of great benefit to me, particularly if it is last minute travel. Also, by having all travel options in front of me, I can make informed decisions which ultimately affect the cost to the company. "Easiest booking and managing of your business trips ever"
The convenience aspect is definitely a game changer on TravelPerk. Booking your flights, hotels, trains tickets (!) in one place, and then accessing it easily via TravelPerk App. At the same time, our Finance team gets an invoice with all the answers about the trip. This is what makes it so easy. I once had an issue with the hotel in Germany, where they forced me to pay 10% of my total sum on Check-in. I reached out to TravelPerk, and a guy explained what happened and why; then ensured this didn't happen again and reimbursed the company on the 10% I paid in person. Even though I was irritated by this, expecting TravelPerk to take care of everything, but the quick and humane support made me forget it. 1. Convenience aspect for the employees to book business trips (client meetings, conferences - you name it). 2. Everything's in one place - you can even book a business trip for your whole team. I wrote a quick feedback before but I needed to come back for a better review. I used Travel Perk to book a business trip and I'll repeat myself: I simply loved it. Self-explanatory, easy to use, intuitive and friendly. It's like you really have someone assisting you personally throughout all the process from finding a ticket to get a hotel. Amazing service! That it took me that long to hear about your services. Give it a try and you likely won't use any other service! It is easy to log in, then easy to confirm your e-mail address and even easier to use once you are registered. Just log in, search for the best tickets for your trip and that's it! You can also check a hotel just in case. After it, you won't need to worry about it as an e-mail will be sent with your trip details, in a very organised way. Even with the e-mail sent to you, just go to your profile with TravelPerk and you can see all the upcoming trips, as well as detailed information. I can't stressed much on how nice the layout is. Find the tickets without the hassle of searching in various places. Also, you feel safer using the friendly user interface and everyone using it make it easier to gather all the information you need regarding your company business' travel. "Right tool for the job"
It's the kind of tool anyone would love to use because it's easy, it never gets in your way, it does what you expect and it even looks good in the end. It was my first time using a tool like that, and it was as easy as if it was the 10th time I was using it. I couldn't really understand where the hotels' reviews come from. Are they coming from another website? Or can people review hotels through TravelPerk? And how can I read the reviews? That was the only thing that wasn't crystal clear to me. It'd be great if we could see reviews from other websites, though (e.g. Booking, TripAdvisor, Google, etc). Business trip accommodation and travel purchases. Thanks to TravelPerk I'm able to book my hotel and purchase my flights by myself (so I can choose whatever was more convenient for me) without having to use my own money and having to ask for a reimbursement later. "Only used it for 1 month - but it already saves us a lot time with or travel booking"
Easy to use, easy access for users who need to book flights, centralised platform for admin, where all bookings are visible, no more booking on credit card and it saves us a lot of time to look and book flight for others. Very good platform if you are looking for travel solutions for multiple users or in our case external users too. They can provide their own request of their preferred flighttimes and it saves you a lot of time and hassle. Customer support is very friendly and handles emergency situations correctly. Same as a dedicated Account Executive who will help you through the implementation phase. "TRAVEL PERK is a quick and easy to use booking tool for enterprises. " Compared to other booking platforms TRAVEL PERK offers the possibility to plan even complex Business trips. After planning the trip it can be forwarded to the superior for approval. All this works very quick and efficient via links that are distributed via E-Mail. In the beginning travel confirmations were captured by the spam filter. I contacted TP via the help button. TP replied within a minute and we could fix the issue after a short chat. So the issue was fixed easily. TP is as easy to use as any other booking platform. In Addition it supports complex trip planning and the possibility to implement comapany travel Guidelines. Based on These master data the approval process is very efficient and quick. Consequently both, the employee and the superior can easily comply to internal travel Guidelines. For employees and superiors TRAVEL PERK saves a lot of time and allows to comply with internal travel guidelines. The entire booking is invoiced directly to the Company. So there is no need for the employee to pre-finance the trip and then waiting for refund. The best part of Travelperk is the service level. When your flight is canceled or overbooked or no matter what reason, they will make sure they will do the best they can to help you. That every single person you speak to at Travelperk is so nice and kind to you. ( alright this is a joke) I do not have a bad experience with Travelperk. Just use it, and you will see that it will help you save lots of time and hassle. I saved so many hours by booking all the business travel through the travelperk platform. It is so much easier having all the travel, for example, for one week in one trip together, instead of single bookings at different providers! What I like is a monthly invoice, back in the days I received like 100 separate invoices a month from different hotels/airlines/trains tickets. "Great service and product to book and plan your trips"
Aside from the clean interface which helps to quickly find what I'm looking for, one of the best things is the fast customer or 'agent' service. It allows you to contact someone directly via chat, phone or email to help you with a making a new booking or solving an issue with an upcoming trip. During a trip to Amsterdam, our train had a delay which would have resulted in missing my connecting train. Luckily I was able to chat with an agent from TravelPerk who called with Thalys to explore my options and let me know what to do in the case I missed my connecting train. It's great to see you can count on the agents at TravelPerk when something isn't going as planned during a trip since dealing with this as a passenger is a huge pain. It's still required that you do some research on the best options yourself since TravelPerk gives a huge list of options that can choose from. If the search engine would be smarter and adjust to your preferences automatically, it would be more efficient and pleasant to use. Having employees taking care of their own travel schedule and booking within the limitations set by the management. "Perfect tool for easy travelmanagement"
I like best, that Travelperk is easy to handle, all steps of the booking process are easy to understand and bookings can be done super fast. The support of the Travelperk team is very good and all additional requires are being looked after very fast and good. I think that the Concierge service can be improved (better structure of input fields) and booking a rental car should be easier (with member number,...) but I already gave some input on improvement to our account manager at Travelperk and they are very open for that and are working on improvements. I have realized that it is much easier for us to have all of our costs for travelling in one place and that we can see where we spent our money. Furthermore, Travelperk helps us to speed up the process of booking and let our employees book within the company guidelines. "Great for Travel and business Trips"
How easy it is to use the website, I never had any trouble. The chat is very fast, the give you all the support and answer your questions very well. I have used it several times and never had any problem. The emails are also answered very fast. I spoke in several languages with the support team and they have a great service and it has been great. Being able to keep track of everything is very useful. Up to this moment the only problem I have is that I can't book air bnb from the website, I have to send and extra email and have more steps but it is no that complicate, but it will be much easier if it was already integrated. For one trip I did not received the notification to do the check in, so I did it very late but other than that it has been very easy to use. Keep it up, continue with the great service. Just and the airbnb to be faster and everything will be great. It is very easy to book a plane and have it approved very fast. The way to keep track of the travel plans and also with the approvals it is very easy and fast so it is great to us the travel perk service. We have many people in the company traveling so this tool is very helpful for everyone. 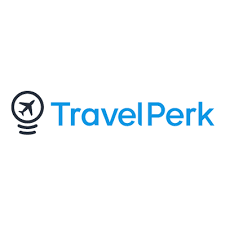 "TravelPerk is an easy to use service and highly recommended for booking business trips"
I like the ease of using the service for booking my business trips. As a frequent traveller to Estonia for work, TravelPerk makes the booking process take literally minutes. It's also really helpful that you can add things like extra baggage and breakfast with a few clicks and this doesn't need to be a separate addition. I love the service for booking personal business trips, but for booking external guests there's still much room for improvement. I had a bad experience with the service when trying to book approx 10 external guests flights and hotel. The itinerary that should have been simple became overcomplicated and this could have been avoided if flights were booked when I submitted the request, not days later. The biggest recommendation is being able to book everything in one place. Also how easy it is to check in and getting the check in reminders is a big bonus. Benefits include being able to easily amend flight and hotel bookings, as well as a dedicated support agent for TransferWise that is a real help. Recently I needed to add some extra baggage onto my flight and it was absolutely no problem at all. Customer support were really friendly and efficient and it really impressed me. "Great service and good price"
Travel perk is more efficient that Google flights for finding the best trip. The search engine has many search criteria that allow you find the best option with various dates, duration, stop over, etc. After giving it a try, we switch to Travel Perk. The travel consultants always keep you informed about changes in the itinerary and are available to explain you about the possible options. It is not about a bad experience, but it is not yet possible to book a train in France. It would be a great addition to the service as the rail stations are connected to airports. This service is still in beta and we are waiting for it. Try the free account, it has great prices and a good level of service for free. First of all, our NGO is not big enough to use a corporate level travel agency, but TravelPerk offers us the same level of service. The second problem that we solved with TravelPerk is about the cost optimization of travels. We operate in various countries (France, Cambodia, Philippines, Vietnam, Singapore, Hong Kong) and the national companies doesn't offer a competitive price for some flight segments operated by a partner company. The third issue was about the centralized reporting. We can now divide travel costs by cost centers directly from the web interface. "Great product with excellent customer service"
TravelPerk is a great tool to plan and manage a business trip. It is easy to use and can accommodate an approval process with email notification. There is also a feature to modify a trip and compare flight prices and schedules. The customer support agents are excellent as they responds to inquiries promptly. Overall, I satisfied with product and service provided. Awesome. There was an embarrassing moment due to a miscommunication of a payment between TravelPerk and the hotel; however, the customer support agent managed to handle this matter promptly. If you are looking for a great travel management system with excellent customer service, I believe TravelPerk is one of the best options for you to consider. In the past it was difficult for us to book flights and hotels. The price was often much higher than regular price. Trip approval was handled manually thru email. Now, TravelPerk brings great experience to the table. I can book flights and hotels easily with reasonable price. Approval process from staff to manager for a business trip can be set up in the system so that after a trip has been approved, there is no need to worry about the payment. There is also a feature to modify a trip and compare flight schedule and price. The TravelPerk's customer support team is also helpful and responsive. Very simple and intuitive to use, shortened the process of booking trips in the company. Extreme helpful support staff, you will always get an answer and a status of your special request or problem! By my experience, very simple and fast way to solve quick doubts using the online chat and very helpful support when needed to book extra baggage and solve other issues. As a user, I would like to be able to search for cities using airports codes (ex. : DUS - Düsseldorf; GIG - Rio de Janeiro). Acceptance criteria: write airport code on the search bar and receive possible cities on a drop down. As a user, I would like to have the possibility to and tags to trips using the app. Acceptance criteria: field where the user can write the tag and receive hints of existing tags for your company, like the functionality existent in the web version. As a user, I would like to be able to search for car rentals. It solved the problems that I had in the past of needing someone from the administrative department available to book my trips. In case of problems or special requests, there is always someone from the helpful support team there to help you! Give Autonomy to book and choose hotels and flights by everyone in the company. Speed up the process of booking trips and avoiding an increase in tickets and rooms costs. Great Support Team, worried about you when some problem happens. Has great information about Hotels and Flights, and a great offer of solutions. TravelPerk is the must-have platform for companies with a lot of travelers. No worries about credit cards and is a quick way to get my trips approved by the Financial Departments without worrying about payments or credit cards. Has A clean platform without unnecessary things that make some booking sites confused. No ads or biased reviews about the hotels! The platform is a bit confusing, presenting the same hotel twice (probably because of the external integrations with Expedia and other providers). Filtering sometimes doesn't work correctly. Can't book the travel for two people if they are staying a different amount of nights. Can't change the number of travelers without resetting the search. Filtering preferences could be stored in the database between sessions for each user, simplifying future searches. Could present some KPIs about the destination such as the average price for a stay by hotel category, the average price for flights, showing to the users if some prices are a great deal or not. Also, the historical rate of each hotel would be an excellent way for that. Probably the best travel business platform for Companies and their employees. No worries about credit cards and is a quick way to get my trips approved by the Financial Departments without worrying about payments or credit cards. "Easy way to book your business trips"
The process to book your business trips is so easy. This is the best tool for that matter that I ever had to use, as some of them are really complicated. This tool, is highly recommended and I'm happy to use it again in my next trip. The only thing that I dislike is the fact that Airbnb bookings are not part of the full automatically process. Even with that, I have to say that everything is quite fast and easy to use, but it would be nice to have it integrated it, so you can't have any chance of losing that flat you like in airbnb. I'm solving the speed issue, which is really important, everything is really fast to do here. It's also easy to use, as some other tool were really messy. I don't have to advance with my money any business trip, which is pretty convenient too. This is a time saver solution when it comes to travel logistics. Select your destiny and the dates, and you are literally off to go. Just select the right combination of planes and lodging. Everything budget-compliant. The tickets and the bookings are completely handled for you. Just download the TravelPerk app, enter your credentials, and check that all your travel details are there. So far so good. The selection of planes and hotels were great. If it could be greater so we have more options that'd be awesome. Also, ground transportation package would make the difference here. I don't have to communicate back and forth with other teams, revise the budget, check within different websites... I just select my trip and press and submit it. If everything goes right, I can handle the trip myself from the data on TravelPerk.com + Airline company. For the modern busy businessman, this is the ultimate platform to plan and book your business travels. Forget your old classic travel agent and the endless emails back and forth until you close a trip, here you plan and schedule directly yourself at your best convenience. Then you just have to wait for your company approval responsible to give you green light! Everything is made in just a few minutes. Sometimes when you have a plan in Draft, for some reasons it says you cannot further edit the plan. This is an example of some occasionally small issues you may find, however, Customer Support is great and the support is very quick! Before I used to sub-contract a travel agency and it used to take very long until closing a travelling plan. Many iterations emails where needed until the travel agent proposes a fitting schedule. And if a change was needed, then we had to go through the iterations all over again. Now I do everything myself at my unique needs, and when a change is needed this is so much easier and quicker! Another excellent thing about travel perk is that we can plan the trips for entire group of cooworkers in case you are travelling with another team members. "Easy to use travel booking site for teams"
* It is great that Travelperk allows us to let team members book their own trips, and management not having to worry about it. It does not have multi factor authentication. An added plus would be if Travelperk would allow you to compensate emissions with flights, but generally, I think the team is on the right track! This is really great if you were spending time on booking hotels and flight tickets and really thought the team should be able to do it themselves! No more time spending by management on booking trips for the team. "One Account for all Business Travels"
Best thing i like in Travel Perk is, it allows me to book my travel for myself as well as my colleagues at the same time. And I do not use my personal credit card to make the payment. Since company card is already in the profile, it makes us easy to book tickets. I see TravelPerk as one stop solution for all Business Travel Needs. Yes, I recommend TravelPerk to others. Other than ease of use, i liked their customer support. They answered my price discrepancy question and solved the problem. Whenever I have had any setbacks, they have solved the situation in the best possible way. Even when they have not been responsible for the problem, they have helped to solve it. I'm really happy to work with them. It is not a problem, but maybe it is a matter to improve: When you call the customer service with the telephone number of Spain, both the answering machine and the operator answer you in English. At the moment in which you indicate that you would like to speak with someone who speaks Spanish, they pass you to a colleague who attends you in Spanish without any problem. I had to deal with travelperk some train change and an error that occurred with a flight. In both cases they have solved the situation in the best possible way. "Travel booking and management made simple and intuitive." Before, our company we used other platforms, and add some issues, but since we change to TravelPerk i can say we change to a lot better. I am a Team Manager and i have to book and approve the trips for me and my colleagues for the abroad projects and now it is much simpler, intuitive, practical. I can book or approve it from my PC or mobile. Other advantage is since we are using TravelPerk we are paying less for each trip, for a while i was comparing and booking where the price was better and yes i get the best rates in TravelPerk. All the times i needed to use the customer care, it went very well on chat or by email, all the situations were clarified. To speak truly at this moment i have nothing to dislike. Nothing is perfect but so far so good. I would say you have to try it out, only by using you will see the difference. Speed, agility and that means money and time to do other things. Zero issue so far and that means a lot. "Excellent flight search and friendly, fast, helpful customer service"
The flight search is very fast and easy to operate. Sorting and filtering flights by different criteria makes finding the best flight to fit your personal requirements a simple task. For things that can't be done directly in the application (e.g. booking rental cars or train tickets with as-yet unsupported railways), the customer service staff is friendly, professional, and extremely quick in responding to customer requests. I'm looking forward to having rental cars and more railways supported in the application, but it's a minor issue since the customer service staff are so helpful and quick to respond. If you can't find something, just start a chat and the customer service team will be happy to help you out. I save a ton of time over dealing with a classic travel agency over phone and email. We would like it to have even more features, but it's a nice to have. Also, flights could be held for 24 hours at least, because sometimes it's difficult for the administrative department to approve trips with short notice, thus causing price increases or need to change the booking. as said before it allows small and mid size companies to have full control over travel without much effort at the same time that it's the perfect tool for international companies to scale on travel operations. I make a large number of travel bookings for my company throughout the year spending tens of thousands on hotels and flights. I decided to try out TravelPerk over Booking.com and I would NOT recommend any company using this service if thinking of doing so for company travel bookings. With regard to hotel bookings, I always need the flexibility of rooms that can be cancelled due to advance bookings on a large scale. When you select this on a filter, it not only misleads you to hotels that actually aren't cancellation friendly but upon booking any rooms, TravelPerk use various agents with different cancellation policies so you could book different trips at the same hotel and have different terms and conditions? There are various other complications including not being able to see changes on your booking when you make them and chasing refunds when you have cancelled rooms. It is a nightmare to manage and I would NOT recommend TravelPerk to any company - I have lost so much money on behalf of my company through it and when I have explained the complications, nothing gets resolved. For any companies out there looking for a solution to group bookings for hotels and flights, do NOT use TravelPerk - I have never been more disappointed or make such a mistake. Hi Emma, thanks for taking the time to give us your feedback. We’re sorry that your booking experience using TravelPerk wasn’t flawless. Having the worlds largest inventory also comes with the notion that all of our suppliers have different terms and conditions for booking, which are outlined when you book with TravelPerk. We understand that this can cause frustration, so we try our very best to help facilitate these changes and deliver 7-star service to our customers, but at the end of the day, our suppliers manage those terms. We understand for companies like yours, you need flexibility to be able to cancel or change reservations seamlessly. We’re currently working toward implementing that functionality for our users, but we’re not quite there yet. Please let us know if there’s anything we can do to help you use TravelPerk in the meantime. I love that i do not have to do screenshots to express my preferences when asking my office manager to book a trip! I like basically everything, I would only like to have extra things added in the booking list on top of flight and hotel. For example trains. Teamleader, the company I work for, is based in the wonderful city of Ghent that is reachable by an express train from Brussel. Every time I travel to Ghent I also need a train ticket. If travelperk would add these options to its interface my work trips would be even smoother. Surely time management and expense reporting are a lot easier now! Consider that we are a company of almost 200 people that every 4 months gets together for meetings and teambuilding, can you imagine how hard it is for our office team to arrange trips and accomodation for all of them? With travelperks we can express our preferences and the office team can finalize the booking much easier! plus, with saving time, also costs are reduced because prices do not rise that much! Hi Alessandra. Thanks so much for your 5* review, we're so glad you enjoy using TravelPerk. Trains can now be directly booked on the platform, including the journey from Brussels to Ghent. Hopefully this will help make your trips even smoother in future! "Quick to respond, efficient in helping"
The Homepage is connected to an app which is easy to use to check bookings etc. while travelling. Prices are not higher than if you would check for yourself. If any problems show up (especially when flying) you get quick and effective help that usually fixes your problem. Since all booking is prepaid by Travelperk, if you enter a hotel for check-in, most of the hotels have already prepared a sheet with personal details that are filled in with the details of Travelperk, not mine. This is especially annoying when i book a hotel that sends out door codes via e-mail or telephone as these messages go to Travelperk and not myself. Easy business travel solutions for company that easily allows managing your travels or travels of your employee. I love that I can plan a complete trip. I first create a new Trip concept with my dates. Preselect flights and hotels. Leave it and return to finish it without having to do the search all over again. I love that it saves the draft of my trip. Also, I liked that I could book and cancel and rebook another flight with ease. The customer service were super nice and quick. Also, we were going on a business trip with some of my collegues and it was super easy to create a trip for all of us together on the same flight. Basically the same procedure, no hassle with the authorization and payments. First I couldn't find the Drafted Trips and kept creating new ones because I thought I've lost them. I had to ask the support team where to find them or how to really save the project. I thought I hadn't save them. It was my falut for not looking at the options at the menu. It is so much easier to book business travels for your own or even for groups. The budget and the payment goes directly to the head responsible. I can make reservations and just transfer my plans to my boss so that she accepts the budget and pay for it. It is so much easier that all those mails back and forth with our old travel agency. "Customer service is great and super quick!" I've had to make changes to my trips and the customer service team via chat is super helpful and quick! I connected and started talking to somebody within 3 minutes. We worked through my changes and then realized it wouldn't be worth it, so they actually helped me save money by disclosing any fees imposed by the airline upfront. I use TravelPerk not so long. I do like it simple interface and it super easy to plan my trips here. But for example I would suggest to move some filters, for example "Price" to the main screen. I definitely recommend TravelPerk to others. You will find it easy to use and it will be your wand in planning trips. I not travel too much. But if need to go somewhere it harder sometimes for me to plan my trip. So I need some instrument that can help me to find and but tickets for a train or flight and book a hotel. I used a couple of different services, but they were overloaded with functionality I do not need. Then I found TravelPerk. It has what I need. TravelPerk helps me with my trips every time. I like the way everything flows from search to booking. I don't like the fact I cannot add a passenger while in the booking process. It offers a great user experience, efficient and easy to browse around. I enjoyed the opportunity to look into hotels and flights which were compliant to the company travel policy so the approval process was super fast. I can personally look into flight options and hotel accomodations according to my taste and needs while staying within the company budget and guidelines. The thing I don't have to rely on a travel agent but can do everything on my own means a lot to me. What I like the best about TravelPerk is not only the easy utilization and user experience but also the frequent updates with better functionality and more intuitive for the user. Besides that, they also provide a great customer service and quickly respond to every request you may have while using it. Of course there are some features that could be added. For instance, the possibility of adding an automatic process to book flights when the prices where below a specific value for specific dates would be an awesome feature that would save the user a lot of time of research. If you have to take care of flight booking for your company, TravelPerk is the way to go. It's easy, affordable and you get real prices of the flights you get. The customer service is also really responsive and they help you with any sort of doubt you may have while using the platform. I've booked around 70 flights since October on the platform and I wouldn't trade this for any other option that I know. They just released new features so I'm still figuring out what their new updates has brought to the platform. Hope they keep with this level of service. The booking of company flights and control of the invoices from the worker's trips. The fact that the invoice goes directly to our finances department with the invoicing details they need is amazing. Prices are right, attention is quick and platform works flawlessly. Very nice mobile app too. For our workflow there are some features that would be nice to have. For instance, we work with internal project numbers (PRxxxxxx) and it would be great if users couldn't proceed with the booking unless they filled in a mandatory field with that format, as it would make our internal processes for allocation of costs and resources much easy and free of errors. A rental car feature would also be very useful. Prices are right, the same as the ones you can find on the internet, if not better. Also the communication options (chat, email) help us a great deal if there's something to work around a booking. The mobile app is great to keep track of your trips, and we didn't have that with our previous provider. "Hassle free and awesome travel booking experience"
I am a first time user of the platform. This is one of its kind. The platform scores full marks on User Friendliness and ease of use. The UI is very intuitive and very few number of steps were required to select a travel schedule and get approval. Notifications were prompt and I believe that the work flow was managed quite well. Try it before making decisions. It really pays to have an automated system for all your travel management. I am an end user who was trying to book a ticket for my travel plan sponsored by my employer. I felt that using it saves a lot of time and exchange of unnecessary mails. Which improves the turn around time. "Great app that helps me to save time!" The app is developed to make eassier the company trips bookings. It is really easy to use, and it avoid lot of usual steps yo have to do when booking through any other webpage. The customer service always help when booking and they have called me several time to offer help. So the service is fantastic. Just for say something, mobile app is still being developed and there are several options not available yet. It avoids lot of registrations in different webpages and to have to fill in lot of forms again and again. It is also very useful to get the invoice once you book a trip, or you can join all your trips in just one invoice. "Revolutionising how business travel is managed"
TravelPerk is a mixture of all of your favorite Online Booking Websites, but with the convenience of being pre-packaged and geared toward business. The User Experience is phenomenal, and most of all - its fast. Really Fast. Being outside of the US, the setup mean't I could only select a few currencies when I registered. But! That was quickly solved by a chat message to their support team that was almost instantly replied to with a complete breakdown of a solution. Booking business travel was always the last thing I ever wanted to do. Our old system was big, and it did the same thing, but it was slow. Walk away and make a coffee first kind of slow... TravelPerk is the perfect hybrid between Corporate Travel Functionality, and Online Booking Convenience. "Convenient, relevant tool for business travel"
- Very easy invoicing : Europeans charged once a month, with very simple invoices. No surprise fees, every charge and refund is linked to the trip ID. Agencies were always more expensive than direct purchases. flights were cheaper on other sites as skyscanner ; hotel offer was larger and cheaper on hotels.com. Now with Travel Perk, I benefit of the best available rates, and my travelers don't have to submit their credit card. The company is charged monthly. "All your business travel in one application"
Full transparency of all our travel worldwide. We can see who is where and when. Great for our Finance Dept. too so costs are allocated to the right cost centre. Generally easy to use as it links with apps such as bookings.com and skyscanner.net, with the back up of the helpline (phone, email and an online chat 24/7 365 days a year for bookings and when traveling). It a quarter of the price of any other agency we've used in the past. TP also take care of special requests so you don't have to. Also, it's great to be a part of helping the app develop and improve more. Any ideas we have are listened to and noted down and in some cases will be implemented. And of course, our account manager, Tiziana Floruss - she is always there to help. There's been a couple of glitches as it's still early days in development and we do have some specific requirements as a company. However, all these have been resolved or TP are looking at implementing certain elements that will help us use the app better. As with any new tool / change, there is always a short period while people adjust to the new way of doing things. Join now and be part of helping TP develop this app further. Better overview of what we spend on travel - who, where, when. "Flawless UX and super-fast customer support"
We've been using Travelperk at Enhancv for over 6 months now. It's really easy to use from booking a flight to a hotel room. We are really impressed with the customer support as well. We get a response within a few hours every time somethings not clear. It makes our Operations team's work so much easier. There's nothing we dislike up till this moment. Definitely give it a go if you let your employees travel a lot. It's a time saver for everyone. Each employee can go ahead and book their hotel/flight for their business trip. No need for the operations team to assist in any way. Flights/hotels are in one place. If you can't find the hotel within the platform, the guys from customer support find it for you in no time. You have flights/hotels/dates of upcoming trips all in one place. I love that you're able to book flights directly from the site and if there is any problem or question, it can be resolved within Travel Perk. The support team is extremely helpful and patient! We've had to contact them quite a bit since signing up, just because plans change and all details might not be known, but the team has been super helpful, and it's appreciated. It's not a huge dislike, but I would like the be able to book the hotel as an additional step right after purchasing flight. It's not always necessary, but I would like to see it more streamlined in the itinerary. It takes the hassle off trying to contact the airlines and wait on hold. Frees up a lot of time. "Easy to use, reliable and with huge variety of offers." plane to hotels takes just a few minutes. Nice system of reminders(ex: plane check it reminders!). On top of that communication between seller, TravelPerk and me as a klient was always easy and fast. I honestly did not found a single flow by now and I've booked a lot of trips already. Do not hesitate. This product will change your way of looking at trips. No more hassle, no more ensuring hotels, planes or anything is booked. A few clicks and you are good to go. I'm travelling to clients all over the Europe. TravelPerk made it smooth, easy and much less of a hassle. the best is the 24/7 available chat they have. Sometimes when you book a flight, then you want to re-book it and other agencies will have their customer service located in India so then you get to talk to somebody with some weird accent who isn´t really helpfull. With TravelPerk it´s completely the oposite. I also really like the help of the agents and how the follow up on every request. Love the flexibility too! There´s nothing I dislike sofar, but I´ve been able to find some cheaper flights through Skiplagged. Which is obvious, as their search engine is rather different, but not necessarely better though. Another important tool that I use so much is openflights.org which will allow me to know with which destinations each airport in the worlds connect. Hope you can integrate that into the site in the future. It´s so much easier to book flights. Normally in the past I would pay them myself and then do all the travel expenses administration which is a hasle. What I also really like is that now, I don´t have to be financing my employee until I get the travel expenses paid. "Easy to use and very efficient to organise your trip"
TravelPerk allows to easily buy the plane tickets and book hotels for your trip directly from a web-page. It is not needed to give detailed and, sometimes even complicated, instructions to a travel agency agent in order to get the tickets or book the hotel you want. You can organize your business trips easily as you are used to organize your personal trips. In addition, they store your travel data and you do not need to fill complex forms. The management of the travel approvals is also very easy since it is fully automated. The only thing I disliked was that in case of two persons traveling, it was not trivial to specify if you wanted one or two rooms until you selected one of the rooms presented. The time spent to buy tickets and book hotels is shorter than with conventional travel agencies. The management of the travel approvals is very easy since it is fully automated. "Great combo of automation and personal service"
The interface is surprisingly clean for a travel app. Search is simple. By far the best feature is the customer service, should you write in the chat. I had to add a route and Georgina checked with me the logistics and pricing. I also like that the accommodation is sourced straight from Booking.com, so you can read the rather thorough reviews there. As mentioned above, the search doesn't find as many routes as other sites (i.e., Skyscanner). In this case you have to chat with an agent for them to add it. This app requires some degree of comfort with technology, as the UI is very sleek and Web 2.0 and may not be immediately understood to older users. This app greatly streamlines business travel, from booking to expensing. It also puts the human touch back into the process, if you get to check your route with an agent. She even tried to find me a better route. "Great solution for a business traveller that also manages a team"
I have all of my trips in one place instead of jumping around my gmail and looking for itineraries and asking for invoices that airline companies do not provide (in 2019! ), etc. Just removes the clutter and also organizes my trips in one place. As more as I use it, I kind of see it as the "travel agents" in the modern age. I like the support option and that you can ask real people things you need and they go and take care of it. 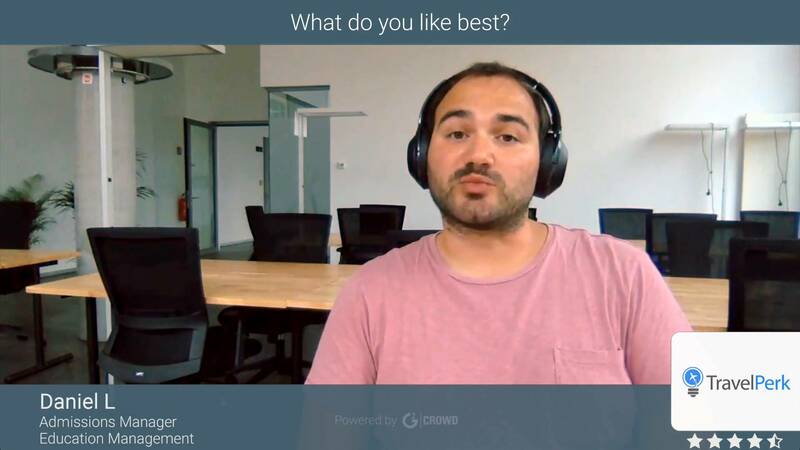 "A new tool to discover"
What I like the best is that you do not need to be in touch with your finantial team to plan the travel, you do it by your own and then they give you the feedback. It makes things easier and more independent, but you have control of the budget! My primary role is user but I also work with a colleague that is administrator and at the end of the month when we have to check all the costs, it is so simple now! What I dislike was that you could not download the tickets of the train, only the booking reference, but last time I could so you have solved it! I will try plane tickets in two months, I am pretty sure that the experience will be as nice as train tickets! We are teachers and we need to reply applications of other organization really fast, using Travelperk all the teachers are more independent but we are coordinated as a team. This reduces the amount of paper and also the meetings, because you can book your tickets and hotel by your own. * We monitor all TravelPerk reviews to prevent fraudulent reviews and keep review quality high. We do not post reviews by company employees or direct competitors. Validated reviews require the user to submit a screenshot of the product containing their user ID, in order to verify a user is an actual user of the product. Hi there! Are you looking to implement a solution like TravelPerk?